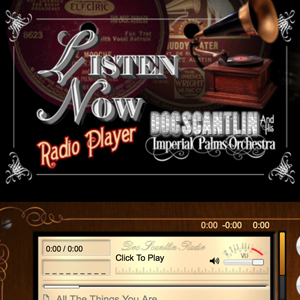 The world received a unique and whimsically fun present this year: the new and remarkably hip Doc Scantlin and His Imperial Palms Orchestra website! The site, designed by Richard Zampella is more than just a long-overdue celebration of what Forbes Magazine calls the “world’s best band”, it’s filled with little surprises that have never been available before in any form of any kind, YouTube-ish or otherwise. The Doc Scantlin Website is filled with little surprises – such as the old timey radio featuring a bunch of Doc’s classic hits that – believe or not – have never been available before in any form of any kind. 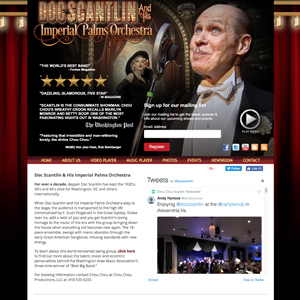 We were floored by the brilliant new home Richard Zampella created for Doc Scantlin and his Imperial Palms Orchestra. It remarkably shows us as we are, in spite of our lack of interest promoting ourselves or creating content for online use. 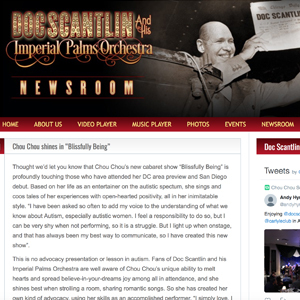 The New Doc Scantlin Website by Richard Zampella at Transmultimedia is a loving homage to the music of the era and infused with web technology where everything old becomes new again.